Boom! Now you're on the baseball picks page. If you're not logged in as a member, you'll see one free game listed and all the other games will be shaded out. So, it's best to log in here and get full access to all the games. Click "Login" at the top right of the page, as demonstrated by the green arrow in the image below. 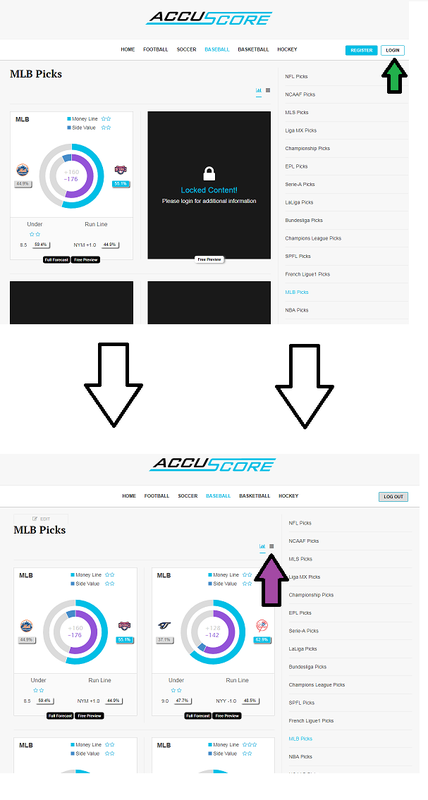 And so, now that you're in member mode, there are two primary ways to read AccuScore's picks. The graph view is the default view with the shaded in circle, but you can also enter the grid mode by clicking on the purple arrow in the image above. 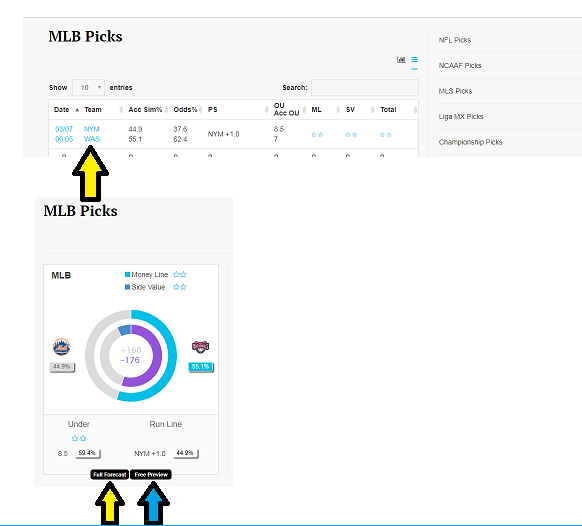 Above the circles, one finds star-ratings for the moneyline pick and for the Side Value pick. These stars rate from 1 to 4, with a 4-star pick meaning that a significant number of historic trends increases the computer's confidence in that particular pick. Below the circles in the shaded bottom third of the box, there is an Over/Under pick. In the example above, the computer's pick is listed as "Under" with the total runs line set at 8.5 runs. Next to "8.5" AccuScore shares its confidence in the pick by detailing that 59.4% of AccuScore's simulations went Under 8.5 runs. Next to the Totals pick, AccuScore also lists a Run Line pick. 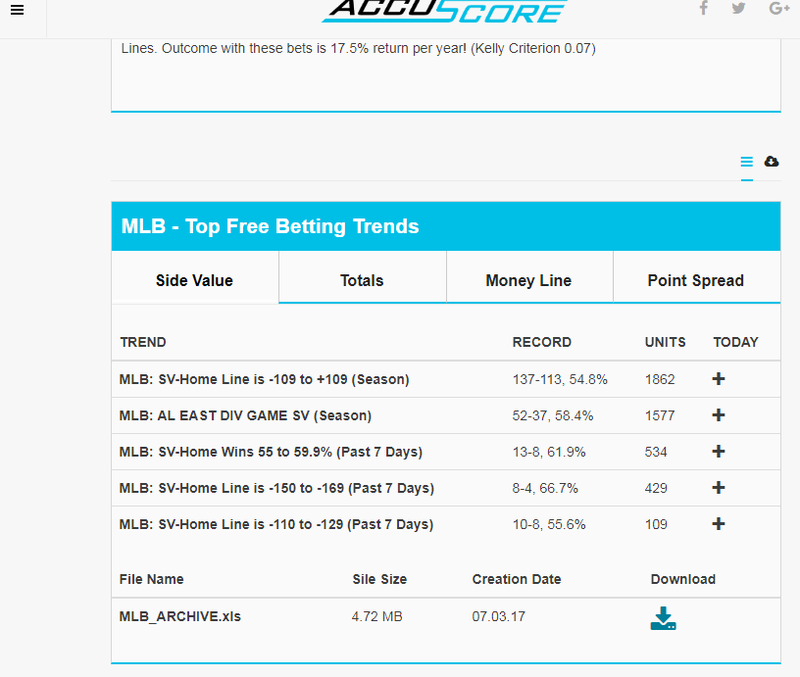 In the example above, AccuScore's pick is the New York Mets with a +1.0 runs handicap. 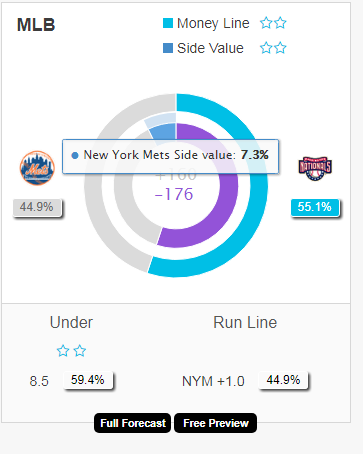 In this case, only 44.9% of simulations ended with the Mets winning outright, while 25.1% of simulations ended with the Mets losing by exactly one run and the Nationals winning by 2 or more runs 38.0% of the time. As such, the pick is Mets +1, as this is the most likely outcome. "Date" and "Team" should be pretty self-explanatory. Then, we get into "Acc Sim%" - This is AccuScore's simulation results. In the example above, Kansas City won 36.4% of simulations, while Seattle won 63.6% of AccuScore's simulations. The "Odds%" column is Las Vegas moneyline odds converted to a percentage. Seeing the percentages side-by-side shows you where the value is. 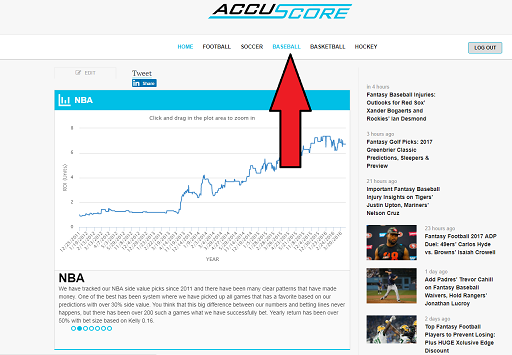 In the Seattle vs Kansas City game, AccuScore's 63.6% for Seattle to win is greater than Vegas's 56.4% to win, so there is value in picking Seattle on the moneyline in this example. "PS" is short for Point Spread, which means the handicap pick. The picks are listed in order: "Seattle -1.0, CHW +1.0, etc." "OU" on top of "ACC OU" is the Over/Under, or Totals, pick. The top row displays the current Total Runs line in Las Vegas. Below it, AccuScore lists the computer's calculated line. If it's higher than the Las Vegas line, the pick is Over. If it's lower than the Vegas line, the pick is Under. Simple. 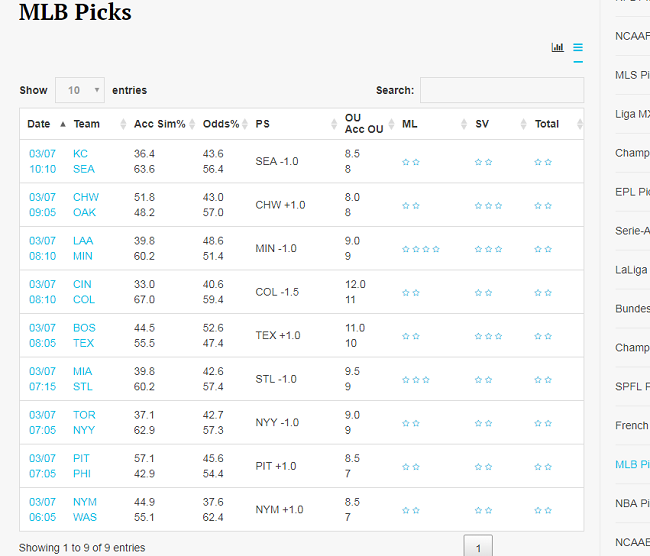 The Grid view also allows you to sort picks by star ratings for Moneyline, Side Value or Totals. New to AccuScore? Try membership FREE for 7 Days...you won't be charged if you sign up for a trial: Try AccuScore Membership Free! By clicking on the yellow arrow (below) in either mode, you can enter the full game forecast. The blue arrow points to the written free preview and trends available for all games. 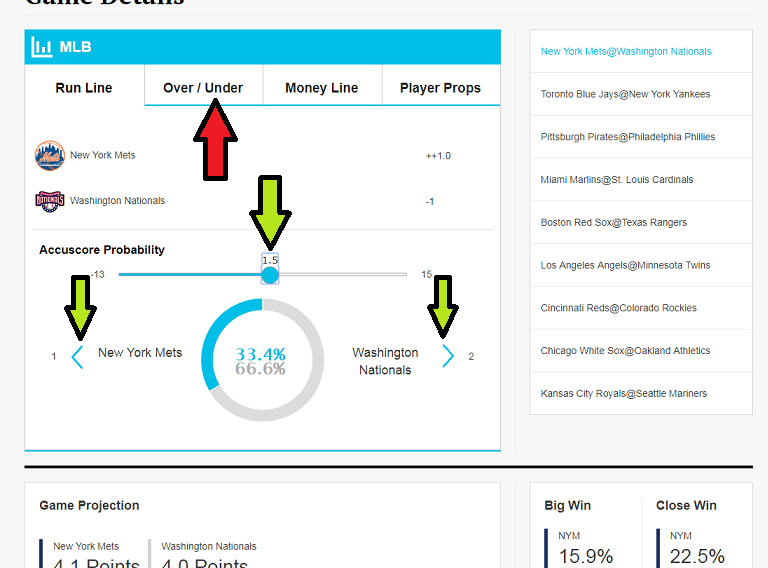 Inside the game preview, you can adjust the handicap lines and adjust the Over/Under lines to see AccuScore's percentages at any different line within reason. Using the red arrow in the image below, you can use AccuScore's extra tools to adjust Handicap Lines, Totals lines and view player props. The green arrows below display how to use the tool to adjust lines.